Funny, it wasn’t until recently that allspice became incorporated into Mexican local cuisine. Allspice has been grown in Mexico since the 1600’s but was seen as an exotic and expensive spice for export. Allspice is as unique and simple as it sounds. It is the only spice that grows exclusively in the Western Hemisphere. 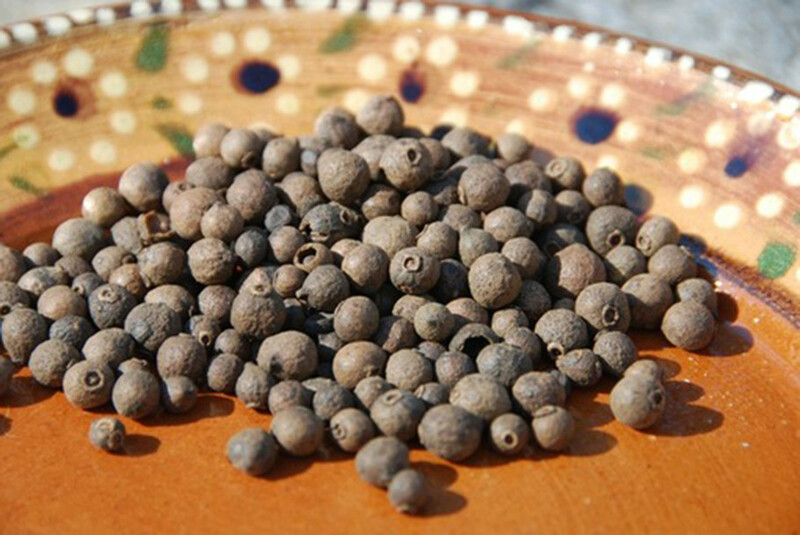 When the Spaniards first encountered it in Jamaica, they named it pimienta because of its close resemblance to peppercorn. Because allspice is much larger than peppercorn it earned the name pimienta gorda, which literally means fat peppercorn. The english name allspice comes from its aroma, which smells like “all the spices” with hints of ginger, cinnamon, cloves and nutmeg. Allspice is grown in the tropical climates of Veracruz, Tabasco and in the Sierra area of Puebla, where the same mountain vapor helps the growth of coffee. Allspice, for some reason, goes really well with chiles. I am curious whether allspice is ever used in any sweet recipes in Mexico (desserts,cookies…)or in savory ones only? Hola Margaret, Thank you so much for watching and for the kind words! Your comment about the beans made me laugh…I’m glad I was able to give you a few pointers to help them turn out better.